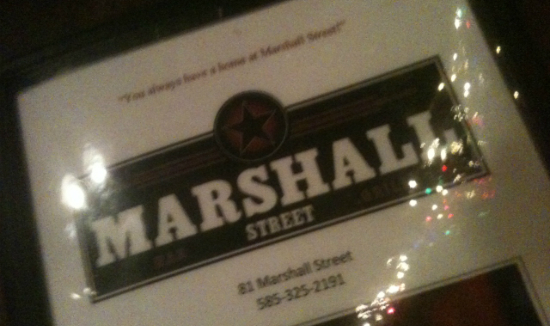 I like the Marshall Street Bar and Grill. It’s right down the street. The neighborhood it’s in is astonishingly pleasant. It’s neighbor to the Abundance Cooperative Market. It is a spacious establishment with a good bar, lots of taps, and ridiculously sized projection television sets for basketball. Dad and I lunched there today, determined to try their wings. We concluded sadly that the best wings in town are still at Henrietta favorite J.B. Quimby’s. No, the thing to get at Marshall Street is the burger. It’s a humble burger with a two-patty approach that makes it great to grab. Plus, hey: Waffle fries. I like lining up my local favorite joints. This entry was posted in Food by Aaron B. Pryor. Bookmark the permalink.